If you are landing on this page, it's likely because you need a new forklift seat. And who could blame you? Forklift seats take a TON of abuse, are used pretty much all day by some of the toughest, biggest dudes (and dudettes) in your company! First things first. How to figure out if this is the right seat for your forklift? Answer: You can likely install (McGyver) this seat on any brand forklift. But it's really designed for Toyota forklifts, more specifically 6 series and 7 series forklifts. If you look at the data tag on your forklift if your forklift model starts with 6 or 7 then this seat will be perfect for you. Secondly, check out the dimensions below and the look of the seat. If it looks like your old one, chances are it will work since Toyota really only used this type on the 6 and 7 series models. Important point for Toyota forklifts. You might check out our selection of seats and see other lower priced seats. Toyota uses a mounting pattern that is different than most other forklifts. You can use other seats on a Toyota forklift but the mounting bolts won't match and you'll have to drill into the hood. Another key point is that the Toyota wingback/shoulder restraint is a safety item. The Toyota seat is designed to prevent the operator from easily sliding off the forklift. On 8 series they started using our model 1011080 seat. Semi-suspension forklift seat. Made of black vinyl this is a direct replacement for the most popular seat used on Toyota 6 and 7 series forklifts. Unfortunately no replacement cushion is available for this seat. Toyota reference number 5308-01. Note! 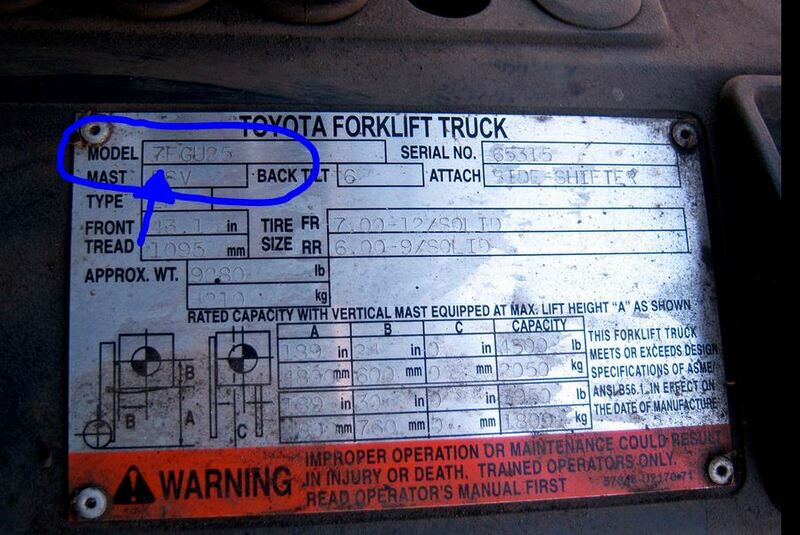 5308-01 is a generic reference number for any seat on any Toyota forklift. This seat will fit your forklift if you have a 7 series forklift and if your parts manual shows reference number 5308-01. Scroll below for the 8 series seat which will fit on 8 series + reference number 5308-01. Questions? Just call us 616-796-1288.